Scheduling telemedicine visits in the Chiron platform is simple, and your staff can begin setting up video visits in a snap. athenahealth: Select Telemedicine as the 'Appointment Type' in athena and schedule the appointment as normal. CareCloud: Select Telemedicine from the appointment 'Category' in CareCloud and schedule the appointment as normal. drchrono: Type Telemedicine as the visit 'Reason' in drchrono and schedule the appointment as normal. Greenway PrimeSUITE: Select Telemedicine as the 'Appointment Type' in PrimeSuite and schedule the appointment as normal. Greenway Intergy: Select Telemedicine as the appointment 'Reason Code' in Intergy and schedule the appointment as normal. Kareo: Select Telemedicine as the 'Visit Reason' in Kareo and schedule the appointment as normal. 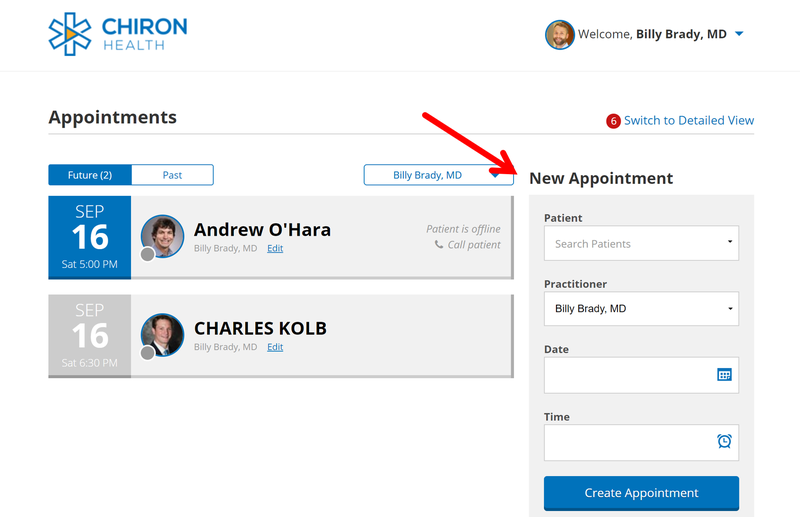 If you use a different EHR platform, you can schedule appointments directly in Chiron. Don't forget to bookmark: https://clients.chironhealth.com. You may want to block off that appointment slot in your EHR platform to avoid double booking. There are two methods common methods of appointment scheduling used by Chiron clients, Mixed Scheduling and Block Scheduling. 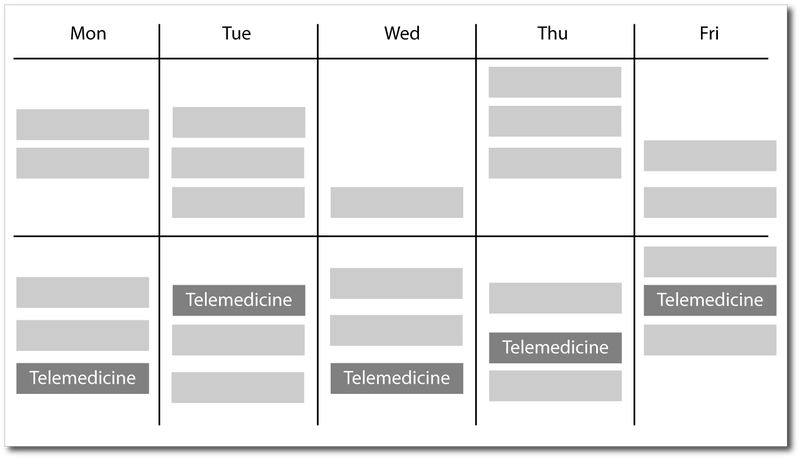 The highest performing practices use both approaches, scheduling an average of 10 telemedicine visits a week. The mixed approach to scheduling places video visits alongside in-office encounters. The practice functions just as it does today with providers grabbing an empty office or exam room to perform telemedicine visits from the office. It is not disruptive and gives patients a great degree of flexibility when scheduling. 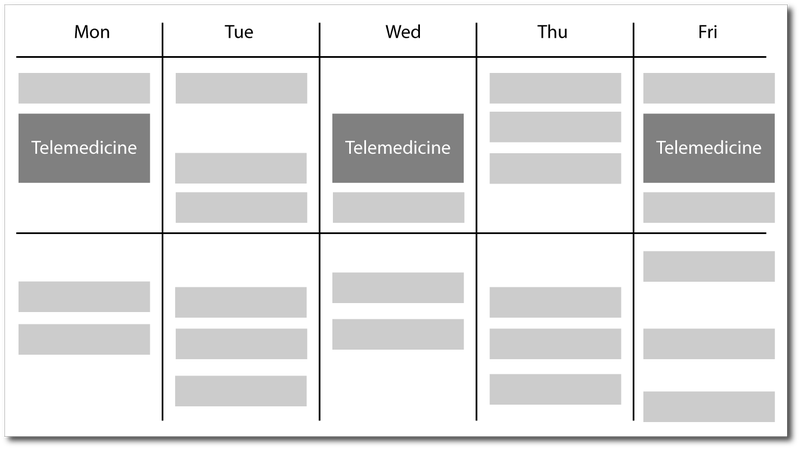 In block scheduling, time is set aside on the calendar for consecutive telemedicine visits. This is a very efficient way of conducting many visits in short order without interruption. It also allows providers to work from home. A common practice is for providers to work from home conducting telemedicine visits in the morning, and then come into the office for the afternoon.